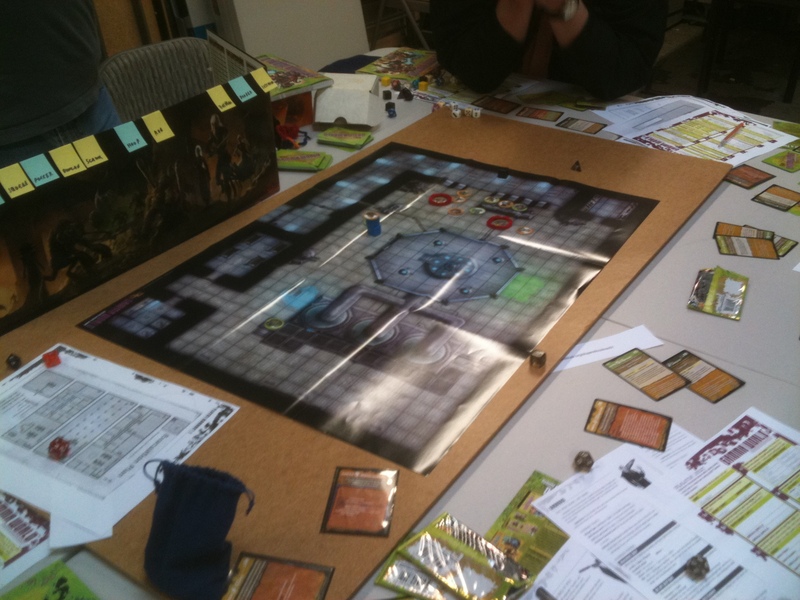 Having just come back from the official Gamma World Game Day event at the FLGS (Game Kastle in Santa Clara), I decided to blog a bit about it, since the game is pretty intriguing to me. The new Gamma World uses a simplified and far more random version of the D&D4e rules, and it definitely lived up to GW’s reputation for zaniness. You could tell the designers made a conscious decision to update it, so for a new edition of a game first published in 1978 it feels pretty timely, to the point where it’ll probably look dated ten years from now. (And someone at WotC is definitely a Valve fan.) The box frankly looks a good deal bigger than it needed to be, since the rulebook is a mere 160 pages in a half-size format (just like Essentials). It only goes up to level 10 though, and it drops a lot of the fiddly rules and details (so for example the skills section is something like 3 pages). Character creation is quick and random. You get two character types by rolling a d20 twice on a chart–I got Giant and Plant–which give you an encounter power each and certain other bonuses (and in the case of Plant, vulnerable 5 fire). Although it’s based on 4e, it drops the use of roles, and characters don’t have all many powers to juggle. You designate one type as primary and the other secondary, and when the time comes to determine attributes you get 18 in the one tied to the primary, 16 in the one tied to the secondary, and 3d6 in the rest (20 if they overlap). The dice were rather unforgiving to my character, so I wound up with 8s and 9s in everything but STR and CON. For all intents and purposes there’s only one “class,” which in D&D terms is average in everything (HP is CON+12, +5/level), and you add your level to things instead of half-level. 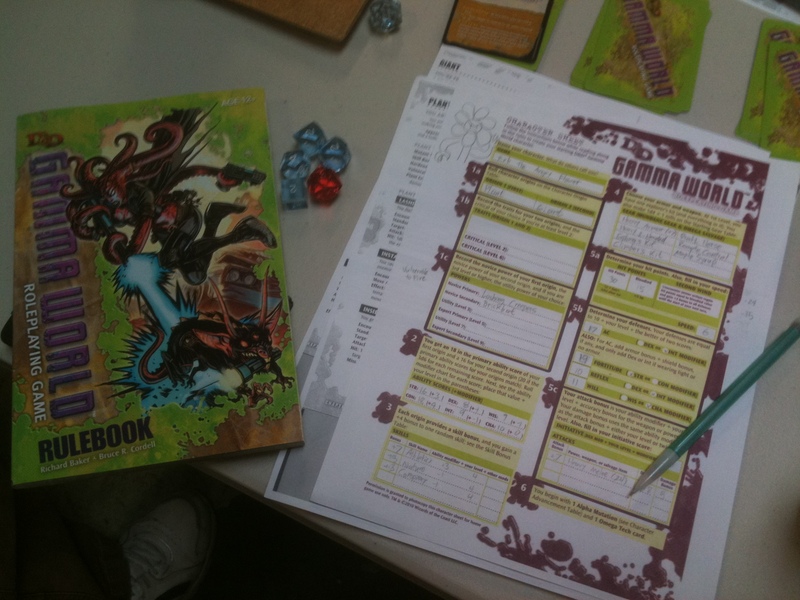 Also, the character sheet is nicely designed and guides the player through the character creation process pretty well. There’s also a fan-made web-based character generator for it. One thing I do like about Gamma World is how readily the game lets you reskin pretty much everything into whatever you want. With a Giant Plant I decided my character was Rob the Angry Flower (apologies to Stephen Notley), a giant mutant daisy that ran around smashing things with an old refrigerator (which in game terms was simply a Large Two-Handed Melee Weapon). It wasn’t quite on the level of Mike Mearls having a Seismic Giant be a 12-foot-tall baby, but Rob was fun to play all the same. As much stupid nerdrage as the optional booster packs have caused, the Alpha Mutation and Omega Tech decks are one of the most fun parts of the game. Both essentially give you new encounter powers, and you get a different mutation for every encounter (and any time you roll a 1 on a d20), and if today’s adventure was any indication the game is pretty generous about letting you uncover new Omega Tech items. In the case of mutations you can also attempt to “overcharge” them. This makes them more powerful on a roll of 10+, but messes you up in some way on a roll of 9 or less. My favorite is the one that boosts your intelligence, but on a low roll you’re Stunned by the stupidity of those around you, though you can also sprout tentacles that might strangle you on a bad roll. While I don’t think the booster packs deserve a tenth of the vitriol they’ve evoked online, I can say with confidence that they’re every bit as optional as I thought, and the game should hum along nicely without them. It’s hard to say how much was the game itself and how much was the way the module was designed, but it was pretty brutal, and 4 out of 6 PCs died by the end. A big part of this was the relative scarcity of healing compared to D&D proper though. There might be some character types that have healing as a matter of course, but in the party we rolled up healing was pretty much only available when a mutation or tech card happened to provide it, meaning it was woefully lacking at times even with the game’s beefed up version of Second Wind (which restores half your HP with a Minor Action). I am reminded a lot of my gaming group’s first foray into D&D4e, where the lack of a proper leader character was hurting us in a big way at every turn. With the one session Gamma World I probably made more death saves than in the entirety of two years or so of playing D&D. The game uses cardstock tokens to represent PCs and monsters alike, and given that I’ve very seldom played with miniatures that exactly represent what’s going in the game, I didn’t miss a beat in that respect. The fold-out maps that came with the Game Day module were very much on-par with the stuff that WotC has done elsewhere, though it’s neat to see that stuff applied to relatively contemporary locations, even as we were fighting mutant pigs and cockroaches in them. I wasn’t at all expecting Gamma World to be a game for long-term play or anything, and my first impression is that it is decidedly in the realm of beer and pretzels gaming. It’s not something you’d want to run a long campaign of (Penny Arcade’s opinion on the matter notwithstanding), but it’s pretty much the perfect game to pull out when your D&D4e group can’t do the regular campaign for whatever reason. Thanks for the review for your paid demo. What was the general size of the player/group count at the store for the event? At Game Kastle there were two groups with about 5-6 players each. I had one person who played the game, say it reminded a little of Maid. The sheer zany randomness of it definitely shows some resemblance, though from what little I know of it, Gamma World was always that random and out there.